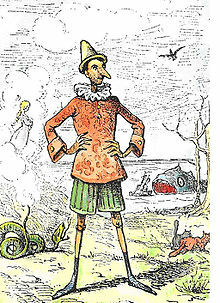 Pinocchio is a fictional character from the 1883 book The Adventures of Pinocchio by Carlo Collodi. Pinocchio is a puppet, made by wood carver, Gepetto. When he tells lies, his nose gets longer. Pinocchio learns about being a real life boy and wants to be a real human being instead of a puppet made of wood and strings. The most well-known version of the story is the 1940 animated Disney movie Pinocchio. This page was last changed on 1 February 2018, at 12:53.